We are very, very saddened to report that Sparky went into cardiac arrest during his surgery and passed away on the operating table. While this handsome and sweet boy was only with us a short time, he quickly became a much loved member of SaveABunny and we mourn his loss. This tragic situation also is a reminder of how fragile these little beings are. Injuries sustained from being mishandled or accidentally dropped, can be life -threatening. Sparky arrived at the San Francisco shelter after being injured by his human family. Donations made for Sparky's surgery will still pay his veterinary expenses, such as the x-rays and the surgery and we thank you. Sparky you light will shine on here at SaveABunny and thank you for gracing us with your presence if only a fleeting moment. Sparky's leg injury is quite severe and requires amputation of his full left hind leg up to the hip. The leg is broken in mulitple places and there are bone shards with an infection. The surgery is estimated at about $1000+ and deemed necessary to give Sparky the greatest chance for a long life. Please help Sparky get the surgery he needs. Your donations are greatly appreciated by both the animals and people at SaveABunny. Sparky is a super cute and active blond boy who was surrendered to San Francisco Animal Care and Control on Saturday, September 8 with a badly broken back leg. 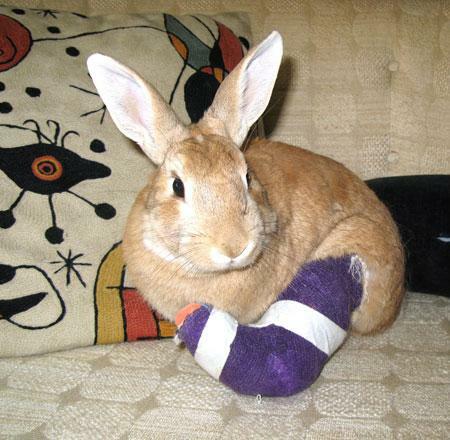 Dr. Bing, the shelter vet splinted the leg and called SaveABunny for rescue assistance. Sparky needs to see an orthopedic specialist and may or may not need to have the leg amputated. Rabbits can live long, healthy and active lives with three legs, so if the leg needs to be taken off, chances are good that he can live a relatively normal life. This sweet and handsome boy is now safe. His prognosis and recovery time is unknown. Sparky will be taken for a consultation at a veterinary specialist and then we will let you know the next steps. Your generous donations will greatly help us to cover Sparky's extensive vet bills estimated at $800-$1500. Sparky was given his name by a young girl who helped her mom transport Sparky to SaveABunny. She said he was bright and full of energy, like a spark. He is a wonderful boy that deserves a second chance. Thank you in advance for your compassion and support!